The ska band in which I serve as lead singer, the South Central Skankers, still has the same name it did when we started 15 years ago. But South Central has changed profoundly, including in its name. And South L.A.’s music has changed with it. The first songs I wrote in our early days were about going out and partying and having drinks all the time with different cliques in which I moved—the skaters, the nerds, the gangsters, the partiers, the paisas. But I grounded those stories with our personal sense of loss—of friends murdered, about the four Fremont High School classmates of ours who were dead by graduation, about walking home from elementary school and not being able to wear red because you might come across a gang member who didn’t like the color. I also drew on my strong memories of being a little kid during the riots, with the National Guard on Florence and in Roosevelt Park right near my house and with everything, even the Western Auto, closing down. When I wrote one of our best known songs, “Welcome to Lost Angeles,” which talks about vengeance for people who had been treated poorly by powerful institutions, we had just gotten stopped by the cops. It was after a late night practice and it happened in my very own driveway, as our drummer was dropping me off. It was just pure profiling—we hadn’t done a thing. But the car was searched and everything. It became sort of funny when my cat came out and jumped in the car, searching it with the cops. Today, as I drive around South L.A., I see a different kind of loss—all the things that used to be there, but have been replaced by new and shinier things. The gangsters my bass player and I used to see on Florence (the bass player was my next door neighbor, living in the house behind me) are either gone or out of sight; law enforcement has cracked down. I never imagined I would be going to shopping centers housing Jamba Juice and Starbucks. The change is mind-blowing. But that just means there’s a different kind of struggle to survive—how to keep up with a cost of living that is going up. We have a few new songs about this reality, including displacement and gentrification. And we’re about to start recording our new EP that will be about today’s South L.A.
I’m grateful for the changes in South L.A.—but also grateful for the South L.A. where I was born (MLK Community Hospital) and grew up. It helped make my music. My parents, both from Mexico, met working in the Tapatia tortilla factory. After they broke up, I spent a lot of time in the house with my two older sisters and their friends, and I got to see their breakups and makeups and heartaches—the things music is often about. And I got to practice my skills at house parties; when I was a little kid, my uncles would pay me $1 to sing songs for them. When I was 14, I started playing the guitar. When I was 16, I met our bass player at the Superior Super Warehouse, and soon we had a drummer and were jamming out to the songs of every band you could think of. We liked all kinds of music—grunge, heavy metal, Mexican, ska, roots. We started playing backyard shows around South L.A. and had a great time. After our first real Hollywood gig, at a place called Espresso Mi Cultura, I saw Left Alone, a great ska band, and I knew that was what I wanted to do. I started taking music more seriously. I was taking classes at Cerritos College; in a studio engineering class, we were required to record live music. My friend Raul and I went to Guitar Center; he got an acoustic bass and we wrote our first song right there in the store. We recruited two high school friends of ours who could sing to write songs, but they didn’t produce any songs. So the night before the class assignment was due, I started writing some songs, and then recorded them. Our professor mastered them and gave us the finished product. Then we went to Staples, bought 100 CDs, and burned them. We had to come up with a name to put on the label, so we went with the obvious: we’re from South Central and we skank. The CDs went over well. Clemente Ruiz, the founder of Evoekore Media, asked us to play our first show, opening for a punk band called Destruction Made Simple. It went well, though I didn’t sing. The rest is history. We built a following, playing bigger shows and venues. We’ve played the big clubs in Hollywood, the House of Blues, even the Knitting Factory, which doesn’t exist anymore. 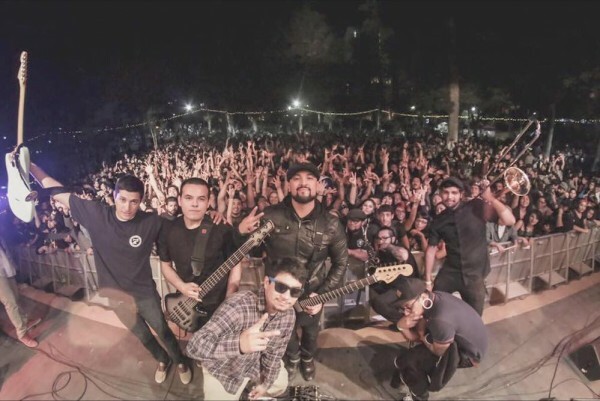 We’ve performed in San Francisco and at the South by Southwest Festival, toured Mexico, and just last month went back to Mexico City to perform with the Mexican skacore bands Sekta Core and Nana Pancha. There, huge lines of people want to take pictures and get our autographs. It’s cool to be in the country of my parents, and even cooler that everyone there seems to know the lyrics to our songs in English. Recently, I’ve been talking to a group that is interested in helping us get out to Japan for some tour dates. I still have a day job—working in the medical field in the Inland Empire. I’m off Tuesdays and Thursdays and every other weekend; we practice and perform on those off days. And we still play backyard shows in South L.A.
South L.A. also has some cool theaters and clubs, but, for all the progress the area has made, it still doesn’t have a very well-organized venue—you know, a place with air conditioning (and legit security in case the A/C breaks down during a show). It desperately needs one. 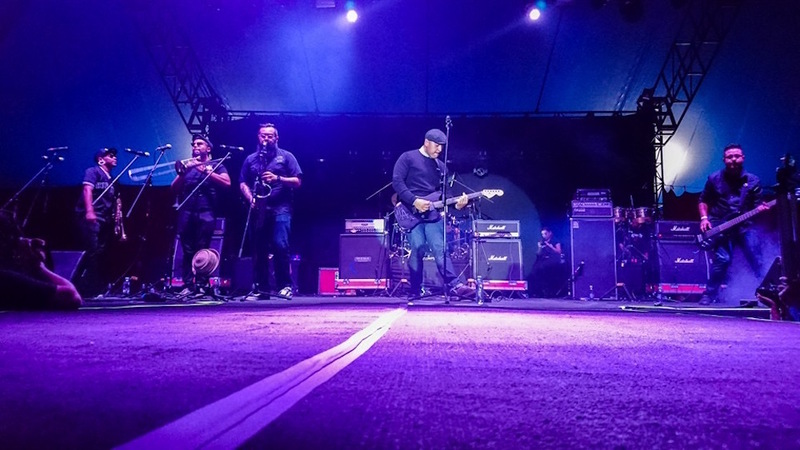 The ska scene has really grown there, with many more bands and shows. Yes, we’re getting older, but the crowds are getting younger. There are so many acts that could use more recognition—the type of recognition that would come with professional management for bands. 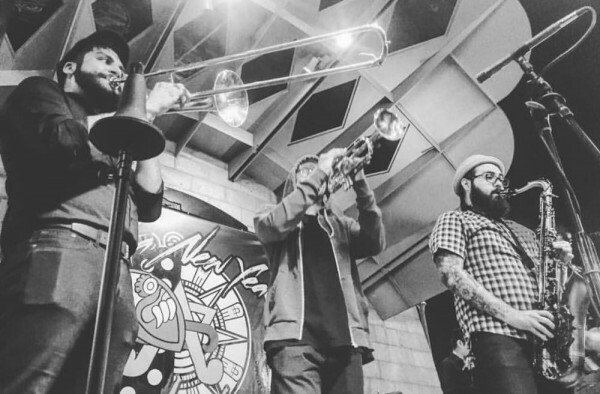 I believe that ska can and will help define the area to the world, and that music could be a bigger part of the business base and landscape of a fast-growing South L.A.
Miguel Rodriguez is the lead vocalist for the South Central Skankers. *Lead photo courtesy of Miguel Rodriguez. Interior photos courtesy of the South Central Skankers/Facebook.